I had the urge to bake something the other day, and a recipe on the back of the Biscuit & Baking Mix (Bisquick, or store brand) seemed like it would be quick and painless, and would result in cake, which was the whole point, of course. I tweaked it a bit here and there. Preheat oven to 350 degrees. For the cake, stir all of the ingredients together in a large mixing bowl until thoroughly mixed. Spread batter into a greased 8-inch square pan. For the topping, mix all topping ingredients together in a medium-sized bowl, until crumbly. Sprinkle topping over the top of the cake batter. Bake for 30 minutes or until a toothpick inserted into the center of the cake comes out clean. 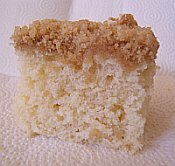 Once the cake has cooled, powder the top of the cake with the powdered sugar so it makes a nice contrast with the brown sugar topping.